Nika has been a valued team member at Smile On for over two years now. She strongly believes in patient education and making patients feel more confident with their smile. She strives to make your visit at Smile on a fun and comfortable one. In addition to dental hygiene Nika has an incredible passion for dance. Originally from Brooklyn, Nika is still making Chicago her home and enjoys taking advantage of everything this great city has to offer. When she’s not out exploring Nika is usually dancing–rehearsing for regional and national competitions or instructing dance classes for dancers of all ages. Monica has been part of our Smile On team since May, 2014. She is currently a senior at Northeastern Illinois University and is working towards her Bachelor’s Degree in Business Management. She enjoys meeting new people every day at our office. Monica also enjoys helping patients understand their insurance benefits and scheduling them accordingly. In her spare time Monica likes to spend time with her family. On the weekends you can find her out in the soccer field helping her husband with his soccer team, and taking their son to his games. She also enjoys reading, going on walks and exploring all of the fun places Chicago has to offer. Since her teens Diana has known that she wanted to work in the dental field. She joined the Smile On team over two years ago with several years of experience and a passion for the field of dentistry. Diana understands how important it is to make patients feel comfortable and makes this her top priority. When she is not assisting, Diana enjoys being active both running and working out with her husband and dog as well as painting, reading, dancing and playing soccer. Jessica has been working with Dr. Poncza for nearly a decade and has been at Smile On since before we opened our doors. With over 15 years of dental practice management experience she strives to make sure that each and every patient experience is as comfortable and pleasurable as possible. Together with Dr. Poncza and the Smile On team, Jessica prides herself on the relationships created over the years with our patients and their families, as well as with the Lakeview neighborhood and dental community. She regularly attends continuing education courses regarding both dentistry and dental sleep medicine to ensure that we are able to provide our patients with the most current and up to date patient educational tools and insurance awareness. When she’s not busy at Smile On, Jessica enjoys traveling, attending the theater, trying new restaurants and just hanging out with her nephews. 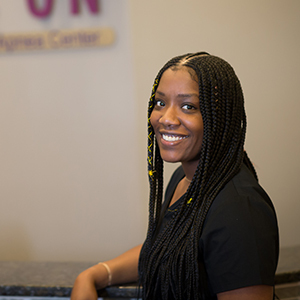 Our newest dental assistant, Eboni, is a Chicago native and has been a member of the Smile On team since September 2016. Hardly a year here with our office, Eboni compliments our professional environment and adds just enough energy to make your visit a little more pleasant. Eboni loves meeting and helping patients, assisting Dr. McDonald and promoting good hygiene habits almost as much as she loves Beyoncé! When she’s not busy at work, you can find her at the movies, exploring the city or checking out new restaurants all while keeping her Smile On.